One more post today on behalf of my sponsor Stacey! She loves vintage Pyrex and she's got a special piece picked out for one lucky reader. And even better still, she's filled it with embroidery floss! The Dish: Dandelion Divided Dish - it is from 1959! 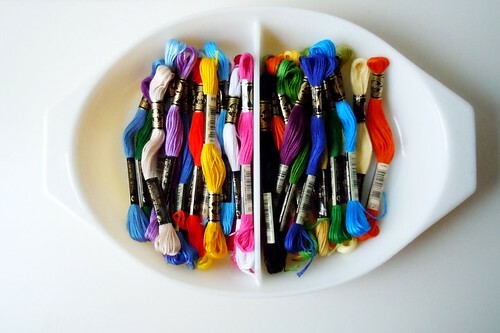 The Floss: 35 different colors! Do you know how difficult it is to not enter myself in this giveaway? If you'd like a chance at this fantastic prize, go visit Stacey at Morning by Morning. Leave her a nice little comment, then come back here and leave a comment with your name and a way to contact you. The giveaway will remain open until this Monday at noon. One of my many goals for this year is to sew more! My project would definitely be to create a beautiful quilt with the lovely Emily, Jeni and Jamie! Thanks for the great giveaway, Stacey! edit: There have been a few folks looking for where to leave a comment for Stacey. Not all of her posts have comments enabled, but most do. Just look for a post that lists comments at the end. Thanks! Love both the pyrex & the floss! I've been meaning to start more embroidery! I also hopped over to her blog to check out her latest lamp restyle! This is a gracious giveaway! I love the pyrex dish. It reminds me of my grandmother's cooking. Let's just say the family keeps everything if it's not broken. That is such a pretty piece of pyrex!!! What a lovely giveaway - I just visited Stacey's blog too - very nice! what an awesome giveaway! i commented on her adorable blog! Amazing giveaway! Thanks for the chance to win it! I love Stacey's blog too! Oddly there does not appear to be a comment option on Stacey's most recent post, but I did leave some love on her fabulous table lamp makeover. Two of my favorite things, Pyrex and embroidery floss! Make that three, because I also love finding beautiful new blogs. Like the others, I visited Stacy's blog but couldn't figure out how to leave a comment. I'm here though and really hoping to win - the dish is beautiful and the floss so pretty and colourful! Love her blog too! I am following it now. Thanks for sharing. 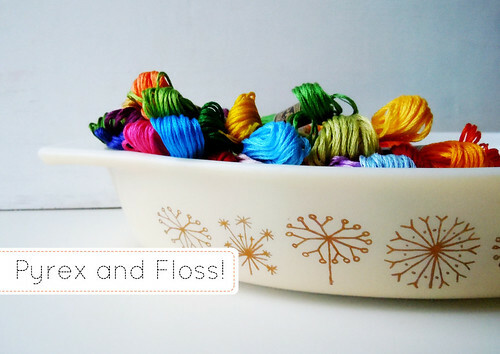 A rainbow of floss and Pyrex to boot! Lovely! Wow, what an AMAZING giveaway!!! PICK ME PICK ME PICK ME!!! heheh Lovely give away! such a fun contrast with the thread and the pyrex! doesnt get any better then those two items!!! 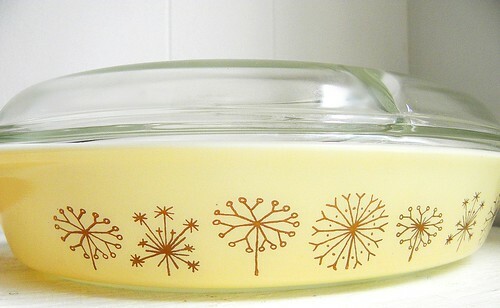 i love the dandelion pattern on the pyrex- it would make excellent embroidery patterns. I love Pyrex and just started embroidery! I also commented on her blog. Ooh, a pyrex form filled with floss - uh-mazing! Had fun perusing Stacey's blog. Whenever I see the word Pyrex I think T-Rex and imagine a Pyrex bowl with dinosaurs on it :) I enjoy looking at the restyles on your blog this evening. Um, I'm definitely in! I left her a comment, she has a cute blog! Am I the only one who couldn't figure out where to leave a comment on her blog entry? It was nice to 'meet' another thrift store junkie. I adore that Pyrex. Thanks for the link to Stacey's site, love the pyrex, divided no less, and I love floss, all the color and all the possibilities. Tried leaving a message but the web gods weren't having any part of it. Hey Mollie & Stacey, thank you both for this giveaway! I've discovered two great new blogs in the process. Can't wait to see the pyrex and floss in my home. Absolutely gorgeous dish - I'd love to win! Stacey's blog is lovely, and I then clicked on some links and got lost in a whole loop of lovely new blogs which have now found their way into my Google Reader. Thanks! Greetings! I live overseas, but I popped over to Morning by Morning to leave a comment just in case I can enter, but mostly to respond to the imagination that went into this rainbow giveaway! That pyrex dish is really something, and the chance to win rainbow floss, well... Thank you so much, and wishing you all the best, Greta. Visited her blog, love all of her treasures! I want to go out in search of my own now. Stacey's blog is great! I can't believe her son is only 6 - he looks like a teenager!! Thanks for the great giveaway, Mollie. Very nice giveaway - love 'em both!! I popped over to Morning to Morning to say my bit. Thanks for this sweet giveaway. I just visited Morning to Morning, and I love her blog :) I'm so in love with the dandelion pyrex. This is an awesome giveaway! i'd like to be in on the giveaway! oh, that pyrex pattern is do die for. and love the colors of that floss. thanks for the opportunity! I follow Stacy's blog...she's the awesome Pyrex collector and mom of Josh, always crafting or redoing something! She has a wonderful blog. Thanks to her and you Mollie, for a great giveaway! Thanks for the chance! i just went to visit her blog and left a comment. i mentioned how when we moved into our current apt the lady who lived here before us had left me her old pyrex dishes! since then i've been in love with old pyrex. i also embroider, so this really is an all around awesome giveaway! What a fantastic giveaway! And I really enjoy Stacey's blog. Thanks for the chance to win! Such a fun giveaway! I love Pyrex and cross stitching. This past year, I've even started to learn embroidery. So glad to have found Stacey's blog through you- thank you for sharing her fun giveaway with us! I've never seen that dandelion pyrex pattern before it's really fun! What an amazing giveaway! Not one, but TWO things I love! Stacey's finds are awesome! Very pretty vintage glass ready for your spring party! Both embroidery floss and pyrex truly brighten my morning! Just visited Stacey's blog! Would love to have a chance to win! Such a fantastic prize! Stacey's blog is too fun! I love her all project restyle stuff. This is a wonderful giveaway; whoever wins will be one lucky person! I LOVE this giveaway, and Stacey's blog is fantastic! Thanks so much for doing it-- i hope hope hope i win (do i get extra points if i tell you that today is my birthday?). ps. i'm ALSO submitting to your above post...i'm always up for a fun craft project! I left a comment on her changing-table-turned-pyrex-shelf post. So creative, and turned out really well. Also, I don't believe I've ever seen a divided Pyrex dish before. Now I find myself wondering if they're fairly rare, or I've just never paid attention. What a great price, the pictures looks so familiar. Reminds me of my childhood. Thanks for the chance to win! I love the old school pyrex dish. and the flowers on it could be a really cool embroidery pattern! I love Stacey's blog - she's so creative! this is an awesome giveaway! how lovely! I had been trying to find Stacey's blog since I read it a while ago and couldn't remember her name. Thanks for the joy of a revisit to her day-brightening writing! And thanks for the chance to win such a thoughtful giveaway! what a great giveaway! love the pyrex and can always use more floss! What a great giveaway! Thanks for the chance to win! LOVE the dandelions! thank you for sharing Stacey's blog it's wonderful i love her restyles especially that little heart garland! Pyrex and floss!! It doesn't get any better than that! I would love this giveaway, she is so wonderful for hosting it! Also, found out about your site because of it, which is also great! very neat giveaway! i love pyrex, but don't have any! I <3 vintage pyrex and embroidery!! I spent a few snow days this winter rounding out my collection of vintage pyrex via etsy and ebay. What a generous give-a-way. I am a follower of stacy's blog and now of this one. Thanks. She has such a great collection! How nice of her to share! I just visited her blog, and I love it! Thanks for adding another blog to my follow list. hope I win! I just commented on her giveaway post!